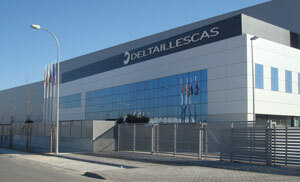 Francisco Puga, chairman of Delta Group, and José María Barreda, President of Castilla-La Mancha region, inaugurated the Delta Illescas facilities located at the ITAC Industrial and Technological Park. They were accompanied by the vice president, María Luisa Araújo, and the mayor of Illescas, José Manuel Tofiño. These new facilities, with a total area of 20,000 m2, will complement the group’s two other plants in Vigo, and aims to produce large aeronautic components. The Delta Group chairman is taking on the challenge of establishing the company in the “Nucleus of aeronautic excellence and at the same time as the reference in composites.” The company has made a commitment to focus on technological development above economic goals, to implant a culture of responsibility and committed work among its employees, maintain its policy of “zero defects,” and have a stable and competitive staff. Delta Illescas, involving a total investment of 31 million euros, will begin with 25 employees, seven of whom are engineers. In addition, it predicts duplicating its economic activity in 2012, so that 45 new jobs will be generated, five of them for engineers.